purpose and principles of the document, and it indicates the source from which the document derives its authority, meaning, the people. The hopes and aspiration of the people as well as the ideals before our nation are described in the preamble in clear cut words. It may be considered as the soul of Constitution. The preamble can be referred to as the preface which highlights the essence of the entire Constitution. It was adopted on 26 November 1949 by the Constituent Assembly and came into effect from 26th January, 1950. K.M. Munshi describes the Preamble as the political horoscope of the constitution. Thakur Dass Bhargawa says Preamble is the most precious part and the soul of the constitution. As originally enacted the preamble described the state as a "sovereign democratic republic". In 1976 the Forty-second Amendment changed this to read "sovereign socialist secular democratic republic"
Preamble – Whether part of Constitution or not? The preamble is not an integral part of the Indian constitution was declared by the Supreme Court of India in BeruBari case therefore it is not enforceable in a court of law. However, Supreme Court of India has, in the Kesavananda case, overruled earlier decisions and recognised that the preamble may be used to interpret ambiguous areas of the constitution where differing interpretations present themselves. In the 1995 case of Union Government Vs LIC of India also, the Supreme Court has once again held that Preamble is the integral part of the Constitution. 1. 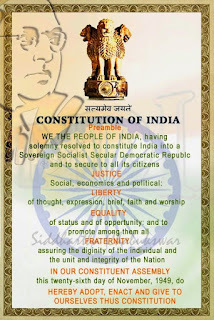 India is a Sovereign State: The Preamble proclaims that India is a sovereign state. Such a proclamation denotes the end of rule over India. It testifies to the fact that India is no longer a dependency or colony or possession of British Crown. As a sovereign independent state, India is free both internally and externally to take her own decisions and implement these for her people and territories. 3. 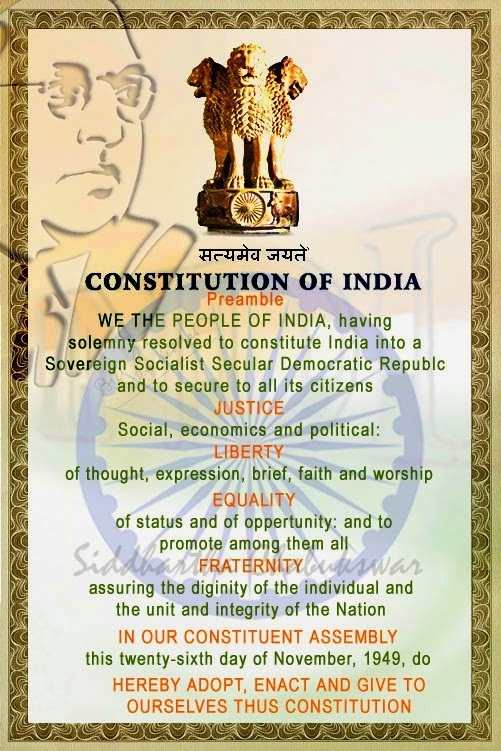 India is a Secular State: By the 42nd Amendment, the term ‘Secular’ was incorporated in the Preamble. Its inclusion simply made the secular nature of the Indian Constitution more explicit. As a state India gives special status to no religion. There is no such thing as a state religion of India. India guarantees equal freedom to all religions. All religions enjoy equality of status and respect. 4. India is a Democratic State: The Preamble declares India to be a Democratic State. The Constitution of India provides for a democratic system. The authority of the government rests upon the sovereignty of the people. The people enjoy equal political rights. The people freely participate in the democratic process of self rule. 5. India is a Republic: The Preamble declares India to be a Republic. Negatively, this means that India is not ruled by a monarch or a nominated head of state. Positively, it means that India has an elected head of state who wields power for a fixed term. President of India is the elected sovereign head of the state. He holds tenure of 5 years. Any Indian citizen can get elected as the President of India. Here, you have done a shameful act by sharing this image of Preamble. It have a word REPUBLIC which in not correct. Please change the image early as possible.